Ever pack your kids off to school or sport with a nice healthy banana, only to find it lurking, soft and blackened, at the bottom of the kit bag a couple of days later? 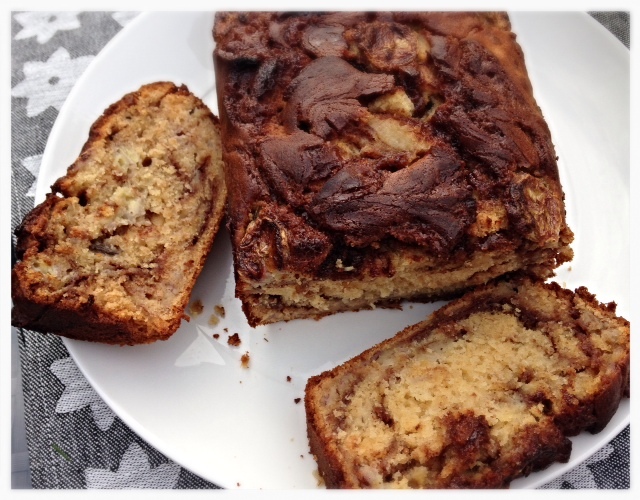 Well, banana bread was clearly invented with the sole purpose of giving them new life. So after finding four bananas at death’s door in various bags this week, it was time to give it a try. And wow… if you only ever cook one thing from my blog, this has to be the one. Following the success of my chocolate chip cookies a couple of weeks ago, I decided to replace the sugar in this cake mix with Sweet Freedom and the result was amazing: moist, tasty and perfectly light. I still used a couple of tablespoons of golden caster and dark muscovado sugar for the cinnamon swirl, but overall this recipe cuts out 60g of carbs compared to the original, and also lowers the GI. And with cinnamon not only being the yummiest of spices, but also having supposed superfood status, what’s not to love? I found the recipe on TheBakerMama blog, and apart from adapting the sugar and fat content, I’ve also re-calculated it with grams instead of US cups. I know many of you visit from the US so I’ve listed both measurements below and also added a link to the cup converter I use here. I’d love to hear what you think – drop me a line below! Preheat oven to 170°C (350°F). Lightly grease and line a 9″x5″ loaf tin with baking parchment. Melt the olive oil spread and let it cool slightly. Pour it into a large bowl and whisk in the Sweet Freedom (or agave syrup), then the eggs and vanilla extract. Stir in the flour and baking soda, and finally, fold in the mashed bananas until just combined. In a small bowl, stir together the ingredients for the cinnamon swirl and combine well. 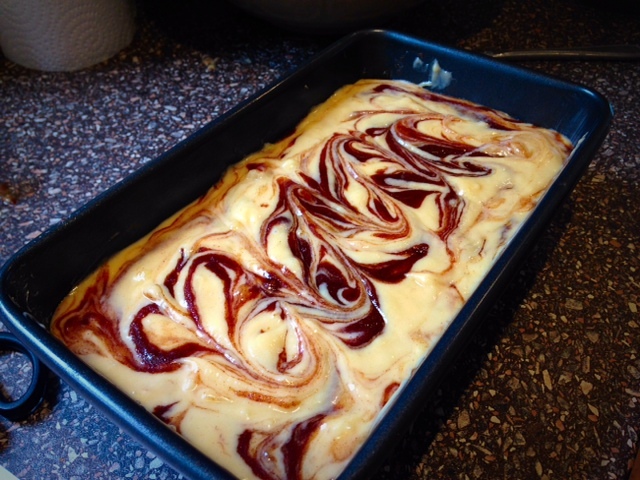 Spread ¼ of the cake mixture evenly into the bottom of the loaf tin, then dollop ¼ of the cinnamon sugar on top of the cake mixture, and swirl it through the batter with a table knife. Place six slices of banana on top. Mouth is watering! I bet this didn’t last long!